Libraries across the borough of Bromley face another wave of strike action starting this Saturday (16 July), followed by an all-out strike across all council services on 20 July. Workers are taking action against cuts and privatisation. Len McCluskey will warn the Tory-led council that Unite and the people of Bromley will not be silenced. Unite has organised the march to send a message to council leaders that the people of Bromley oppose the cuts and the sell-off of libraries, schools, services for the elderly and the disabled. 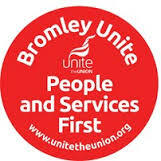 Unite general secretary, Len McCluskey said: “Bromley council is failing the people of Bromley. I am proud that Unite is opposing the cuts. Len McCluskey will also put the council leader Stephen Carr on notice that the union will support Kath Smith the Unite representative who is being victimised for whistle-blowing. “Bullying and victimising a grandmother, whose only crime has been to expose the threat to public services in her own community, is nothing short of a disgrace. Unite will stand with Kath – whatever it takes. “Unite is proud to be supporting ‘Backing Bromley’ a new community group that has grown to fight Bromley council. Over 1,200 residents have raised placards in their gardens to show their support. Workers at Bromley’s libraries will be on strike from 16 to 23 July and there will be a council wide strike for 24 hours on 20 July. On Saturday 23 July there will be a march in Bromley against the cuts and privatisation. The union is also calling for an end to the Tory- controlled council’s attempts to privatise all local authority services. Unite’s members voted by 87% to take strike action in protest against this mass privatisation programme and cuts to pay and conditions. Many council workers have already taken over 30 days of strike action in this long running dispute which began last year. Unite regional officer Onay Kasab said: “Council workers are standing up for local services which are under attack like never before. Bromley want to privatise all council services across the borough. “Unite’s campaign to defend public services has massive support from the local community and on Saturday 23 July there will be a march through Bromley to protest against the council’s demolition job.